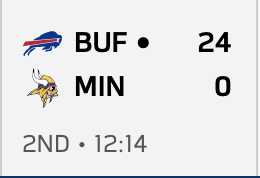 Who is playing the Bills? We def messed up y'all. The only one who got this week right picked the freaking Browns. I feel like the Bills are now personally trolling me. I had the gumption, i put all of my eggs in their basket last week and they didn't do the thing. So this week i join the cool kids betting against them and it's just...fffffffffffffffffffffffffffffffffffffffffffffffffffffffffffffff.